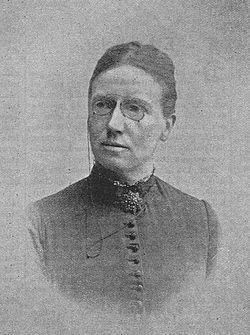 Louise Hammarström was one of the first female chemists in Sweden. Lovisa Katarina Hammarström, often referred to as Louise, was born in Hosjö near Falun in 1849. Her father was a priest who was also educated within the field of medicine. Louise Hammarström’s interest in chemistry probably dated from her childhood as she was in contact with the chemists employed at the nearby works. She later took private lessons in Stockholm and, during the second half of the 1870s, she worked as an assistant at Werner Cronquist’s laboratory. There she also analysed arsenic. Due to the health risks this entailed and new laws in the area Louise Hammarström came to change her focus. During the 1881-1887 period she worked as a mineral chemist at Bångbro works. This was followed by a few years’ employment at Fagersta works and in 1893 she worked at Schisshyttan works. In 1893, having spent nearly 18 years working as an assistant for other people, Louise Hammarström established her own mineral chemistry laboratory in Kopparberg. There she mainly worked on investigating ores, metals, and other chemical products from the local works, as well as undertaking other more general chemical analyses. Louise Hammarström died in Stockholm in 1917. Lovisa (Louise) Katarina Hammarström, www.skbl.se/sv/artikel/LouiseHammarstrom, Svenskt kvinnobiografiskt lexikon (article by A. Johannes Johansson), retrieved 2019-04-24.